Dinner at the Court was introduced nearly six years ago but was later discontinued with the opening of North Avenue Dining Hall. However, Auxiliary Services noticed possible student interest in reviving the program. “Over the past few years we’ve recognized that students are at the middle of campus, and they frown at the idea of walking down Freshman Hill and back up [just to eat],” said Rich Steele, Director of Auxiliary Services. Although the Student Center already provides many retail dining options, students have been unable to use their meal plan swipes there. In response to student demands for meal plan access central to campus, the Student Center Food Court now allows meal swipes to be used during the new dinner hours at Essential Eats and the Salad Bar. Both locations offer fresh, healthy meal options centered around Dining Service’s new campus-wide focus on sustainable eating. Each meal includes an entree, a side, and fountain drink. “We want people to encourage people to eat healthy,” Steele said. Each meal plan swipe also allows two consecutive servings from the Food Court, and students with unlimited meal plans can use their meal plan once per daily dinner period. “The Buzzcard Center has been great. They’ve reprogrammed meal plans, so that for Dinner at the Court, students can swipe their card when they get their meal and they can come back through for seconds,” Steele said. 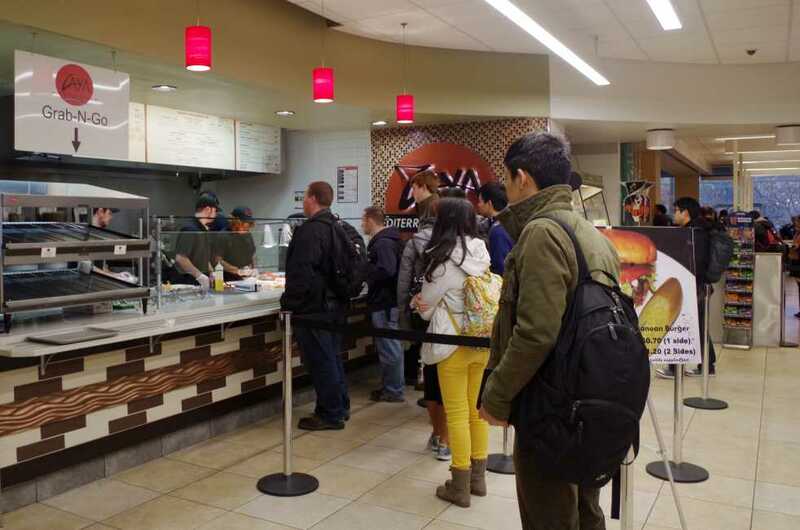 Responding to concerns that meal plan access in the Food Court will cannibalize the sales of the Student Center’s retail dining, Steele emphasized that the new options give students more of a reason to come to the Student Center. “If students can take advantage of using their meal plan for dinner in the Student Center, it encourages them to use the building as a whole,” Steele said. According to Steele, Meal plan costs should not notably increase due to these recent changes. The changes were student driven, according to Steele. Steele reiterated that changes to campus dining options reflect student preferences gathered through surveys, and urges students to provide feedback. According to Steele, operating Dining is more expensive in the food court than in the dining halls. Later in the semester, Twisted Taco and Ray’s Pizza will also begin serving in the Food Court. Construction continues for Twisted Taco, Ray’s Pizza, and an updated sushi bar, which are slated to open in the Food Court later this semester.